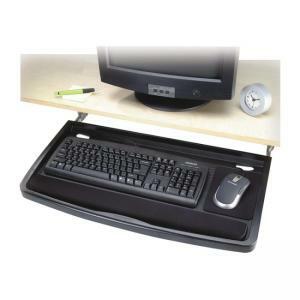 Underdesk keyboard drawer features an extra wide 26" tray with integrated mousing area. Designed for use with standard workstations. Includes wrist rest and mouse pad. Easy installation and cable management. Underdesk drawer can be mounted at one of three heights for customized comfort. Mousing surface can be used to the left or right of the keyboard. Track length is 17".